This article was updated with additional photos; see at bottom. 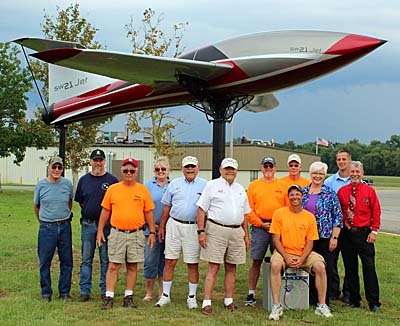 Midwest LSA Expo held a special ceremony to honor two men in their donation of a beautiful LSA-like aircraft now permanently displayed on an striking pedestal near the airport entrance. Lots of airports have military aircraft mounted on pedestals. Even AirVenture, base of the homebuilders, has military fighters on raised displays — including the famous "jet-on-a-stick" near the show entrance. These displays honor a warbird heritage but those aircraft aren't what most members fly. 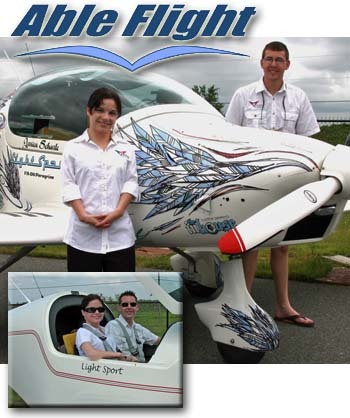 Enter Light-Sport Aircraft. While some have gotten deluxe far beyond the original concept — with prices to match — many affordable aircraft still make up the category of Light-Sport Aircraft, light kit aircraft, and ultralight aircraft. These aircraft are what "real" people fly. Midwest LSA Expo has now reached its 10th birthday, staying focused on showcasing this sector of aircraft. So, perhaps it is fitting that today they had a ceremony honoring a donation of a futuristic jet LSA design (technically "LSA-like"). 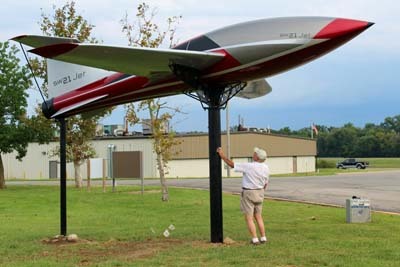 To properly display an aircraft built to be a mockup, airport manager and dynamo Chris Collins organized an effort to make a handsome pedestal for the aircraft. Chris and team had to firmly cradle the aircraft to weather the elements. That they did it so artfully is icing on the cake. A decal on the nose of the Hansen's Peregrine reads, "LSA Transcontinental Speed Record; Jacksonville – San Diego June 8, 2009" — Read the whole story here. At a ceremony to thank brothers Jon and Ron Hansen, who donated the "jet on the stick," Chris got the mayor of Mt. Vernon and other officials to make an appearance. SW21 Jet is another creation of the fertile mind of Hans Schwöller, the man behind the stunning SW51. Jon and Ron Hansen are figureheads in the LSA game since day one. Hansen Air Group was the first U.S. distributor for Tecnam and helped introduce the large Italian manufacturer to Americans. 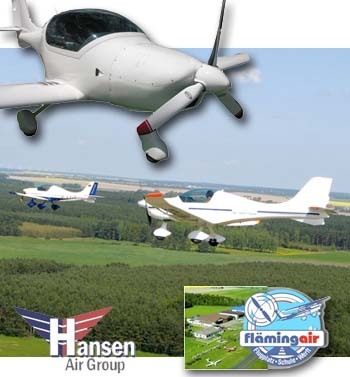 Today Tecnam manages its own U.S. outlet but Hansen gave them a good push forward. 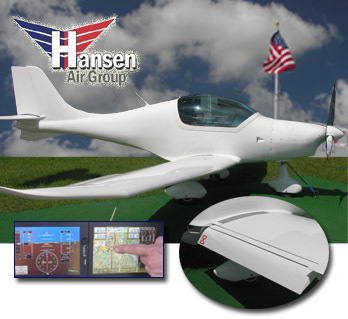 Hansen Air Group has represented other brands such as FK Lightplanes, Sky Arrow, ScaleWings, and others. In particular, Hansen has been a key supporter of using LSA fitted with hand controls to allow handicapped persons take flying lessons. 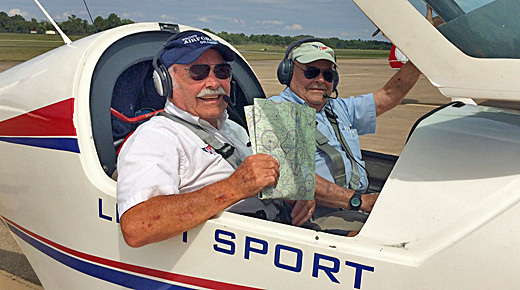 Although Hansen Air Group is gradually easing out of the business, Jon Hansen, brother Ron and Jon's sons Mike and Mitch — all airline pilots — have been important people as the Light-Sport Aircraft industry grew. It's fair to say, LSA would not the same without their long, steady input. Although weather all around Mt. Vernon foiled the arrival of several paid vendors, the airport itself has been flyable nearly all of both days so far. Saturday, the 8th is the third and concluding day. 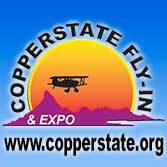 Vendors in attendance logged steady demo flights to prospective customers. 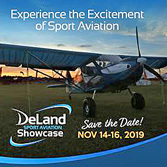 I've written that Midwest LSA Expo is our very best location to do Video Pilot Reports (VPRs) and the same applies to getting a demo flight before you complete an order for a new aircraft. The show and Mt. Vernon airport are extremely good at providing this opportunity. I'll present reports ASAP but time is precious, so I'll just say now that we've now logged four VPRs. On opening day we did the Aeroprakt A32 Vixxen and Rans Aircraft's S-21 Outbound. Today, we captured the AeroEast Discovery 600 and a 914-powered Magni M-16 Gyroplane. Tomorrow, we hope to repeat. It takes a few hours to mount all the cameras, do a series of recorded landings and fly-bys, go evaluate the aircraft for an hour or so, and then record a video recap of the flight and the aircraft. Getting two of these done is an honest day's work. (…then the editing starts — many more hours). At dinner tonight we discussed the 10th year of Midwest LSA Expo with airport manager and Expo leader, Chris Collins. While he's frustrated about the weather east and west Mt. Vernon and those who could not fly in because of it, those that did display gave a steady stream of demo flights and we captured video we hope you will like. I'm calling it a winner. Keep watching Videoman Dave's You Tube channel as these VPRs are uploaded for your viewing entertainment and education. 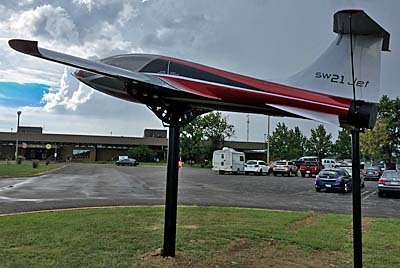 Airport manager Chris Collins forwarded more photos of the ceremony dedicating the SW21 Jet to the Mt. Vernon airport. Of the one with Jon Hansen reverently touching the main support for the aircraft he donated to the airport, Chris said, "I love this shot!" In the second Mt. Vernon Mayor John Lewis makes a few remarks while brothers Jon and Ron Hansen wear their trademark broad smiles. In the lower image, Chris identified all the parties that helped make this unusual light aircraft display possible. Standing left to right are: Fabricators Addison and Brad Sharp, Airport Board Vice Chairman Mike Ancona, Airport Administrative Assistant Sheila Jolly-Scrivner, Ron Hansen, Jon Hansen, Airport Board Treasurer Eddie Lee, Airport Board Chairman Gary Chesney, City Manager Mary Ellen Bechtel, Assistant City Manager Nathan McKenna, and Mayor John Lewis. Chris Collins is seated in front. This article was updated with additional photos; see at bottom. 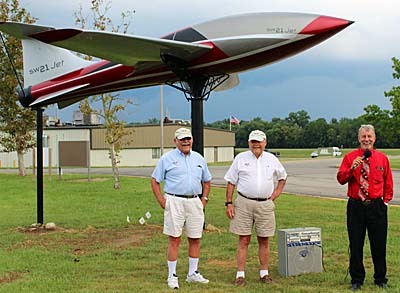 Midwest LSA Expo held a special ceremony to honor two men in their donation of a beautiful LSA-like aircraft now permanently displayed on an striking pedestal near the airport entrance. Lots of airports have military aircraft mounted on pedestals. Even AirVenture, base of the homebuilders, has military fighters on raised displays — including the famous “jet-on-a-stick” near the show entrance. These displays honor a warbird heritage but those aircraft aren’t what most members fly. Enter Light-Sport Aircraft. While some have gotten deluxe far beyond the original concept — with prices to match — many affordable aircraft still make up the category of Light-Sport Aircraft, light kit aircraft, and ultralight aircraft. These aircraft are what “real” people fly. Midwest LSA Expo has now reached its 10th birthday, staying focused on showcasing this sector of aircraft. So, perhaps it is fitting that today they had a ceremony honoring a donation of a futuristic jet LSA design (technically “LSA-like”). MIDWEST LSA EXPO 2012 -- One of our series of many short videos from the fall show, this one on the Flaeming Peregrine. This handsome low wing composite aircraft has been used to achieve a fast cross-the-USA flight in about 17 hours. This was done by some young pilots, one of whom benefited from the Able Flight schlolarship for disabled persons, a great project generously supported by Hansen Air Group, which sells the Peregrine and several other LSA. MIDWEST LSA EXPO 2012 — One of our series of many short videos from the fall show, this one on the Flaeming Peregrine. This handsome low wing composite aircraft has been used to achieve a fast cross-the-USA flight in about 17 hours. This was done by some young pilots, one of whom benefited from the Able Flight schlolarship for disabled persons, a great project generously supported by Hansen Air Group, which sells the Peregrine and several other LSA. Hansen Air Group has long been a supplier of interesting light aircraft. 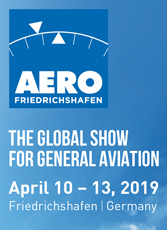 Today this Atlanta, Georgia based importer offers three different airplanes: the Sky Arrow from Italy, the FK-9 from Germany, and the Peregrine from Germany. In this video review of the FP-04 Peregrine, we look at the airplane which set a record 17-hour flight from east to west coast in the USA. Cross this big country east to west in a day? ...in a Light-Sport Aircraft? Yup! On June 8, pilots Matt Hansen and Jessica Scharle successfully completed a transcontinental flight in Peregrine FA-04, dashing 1,813.5 nautical miles from Florida to California. After making five stops along the way the duo touched down at Gillespie Field near San Diego at 10:22 PM, marking an elapsed time of 19 hours and 21 minutes, which includes time for fuel stops. Total flying time was just over 17 hours. 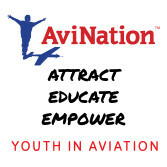 They may have accomplished the feat to help nonprofit Able Flight in its mission to assist disabled folks learn to fly, but I think these twentysomething pilots showed they have the right stuff. That's even more obvious when you hear Jessica Scharle courageously overcame a rare medical condition that fused almost every joint in her body. Nearly immobilized at one time, numerous surgeries, years of physical therapy, and personal determination helped Jessica become completely independent. After all that, a flight across America must have seemed a lighthearted jaunt. Indeed, when Jessica and instructor Matt Hansen arrived and were asked about the toughest part of their flight, they said in unison, "Texas." Hansen, 23, is a flight instructor who trains people with disabilities to fly. Scharle is 24 and an Able Flight scholarship recipient who earned her Sport Pilot certificate last year at Hansen Air Group. Cross this big country east to west in a day? 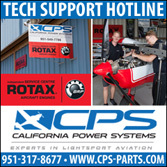 …in a Light-Sport Aircraft? Yup! On June 8, pilots Matt Hansen and Jessica Scharle successfully completed a transcontinental flight in Peregrine FA-04, dashing 1,813.5 nautical miles from Florida to California. After making five stops along the way the duo touched down at Gillespie Field near San Diego at 10:22 PM, marking an elapsed time of 19 hours and 21 minutes, which includes time for fuel stops. Total flying time was just over 17 hours. They may have accomplished the feat to help nonprofit Able Flight in its mission to assist disabled folks learn to fly, but I think these twentysomething pilots showed they have the right stuff. That’s even more obvious when you hear Jessica Scharle courageously overcame a rare medical condition that fused almost every joint in her body. Nearly immobilized at one time, numerous surgeries, years of physical therapy, and personal determination helped Jessica become completely independent. 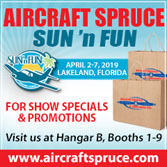 SEBRING UPDATE -- First shown at Sun 'n Fun 2008, FA-04 Peregrine will be present at the 2009 Sebring LSA Expo January 22 to 25. Welcome to warm, sunny Sebring for a winter break! SLSA approval of the Peregrine brings the total to 88 aircraft models and 66 companies. On December 29th, a new Special Light-Sport Aircraft was approved. With only a couple days remaining in this challenging year, I suspect this will be the final approval of 2008. Welcome to the FA-04 Peregrine, which was inspected after assembly at Hansen Air Group in the Atlanta area. I believe this to be the first LSA from former East Germany (which was ironically named German Democratic Republic even though it was Communist). *** FA-04 Peregrine is a low-wing carbon fiber LSA that evolved from Flaeming Air's FA-02, which earlier had won European VLA approval. The interior is 44 inches wide (a Cessna 172 is 39.5 in.) with "lots of legroom" and a large luggage compartment that makes the model appropriate for longer cross country flights. Adjustable seats aid occupant comfort. In an interesting variation, Peregrine has main landing gear that can "easily be converted to a taildragger," said Jon Hansen. 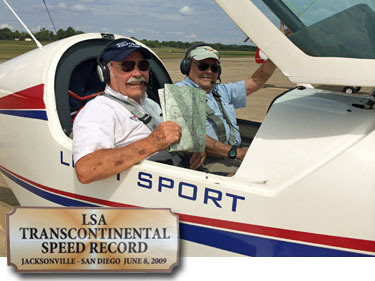 *** Hansen Air Group, an early player in the LSA world that also worked on the ASTM committee, paved the way for Tecnam as its first representative. Later the organization, with headquarters in the east, put its effort into selling Sky Arrow. FA-04 Peregrine represents a significant return to the market for the Georgia enterprise. On December 29th, a new Special Light-Sport Aircraft was approved. With only a couple days remaining in this challenging year, I suspect this will be the final approval of 2008. Welcome to the FA-04 Peregrine, which was inspected after assembly at Hansen Air Group in the Atlanta area. I believe this to be the first LSA from former East Germany (which was ironically named German Democratic Republic even though it was Communist). *** FA-04 Peregrine is a low-wing carbon fiber LSA that evolved from Flaeming Air‘s FA-02, which earlier had won European VLA approval. The interior is 44 inches wide (a Cessna 172 is 39.5 in.) with “lots of legroom” and a large luggage compartment that makes the model appropriate for longer cross country flights. Adjustable seats aid occupant comfort. 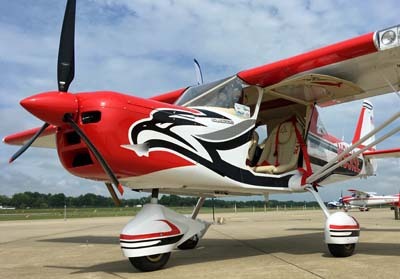 In an interesting variation, Peregrine has main landing gear that can “easily be converted to a taildragger,” said Jon Hansen. In addition to handsome flowing lines, the Peregrine has two outstanding features Hansen displayed at Sun 'n Fun. Fowler flaps extend into two surfaces which makes for very smooth airflow. 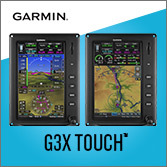 Flymap supplies an optional but gorgeous touch-screen map and primary flight display. You probably know the Sky Arrow. This smooth tandem Light-Sport Aircraft from Italy uses exquisite construction and I found it to fly beautifully (read my report). Sky Arrow is imported by Jon Hansen and his family. 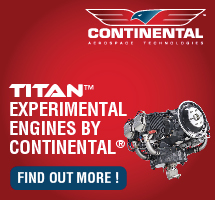 Jon represented Tecnam aircraft (also of Italy) for several years, helping to launch that brand. Hansen Air Group and Tecnam ended their relationship a couple years back, and since then Jon and his team have been seeking another aircraft to represent. That search is over. *** At Sun 'n Fun 2008, Hansen Air Group showed their new entry, the FA-04 Peregrine, built by Flaeming Air of Germany. The low wing beauty is mostly carbon fiber and was refashioned to be a Special LSA, following Flaeming's success at winning VLA approval in Europe. Interesting Note: Hansen's Sky Arrow also started with VLA approval, which helped it qualify as an SLSA. 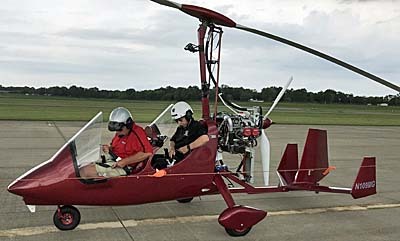 *** "The FA-04's standard tricycle gear can easily be converted to a tail wheel by a certified mechanic," reported Jon's identical twin brother, Ron Hansen. Peregrine specs: span--31.5 ft; wing area--106 sq. 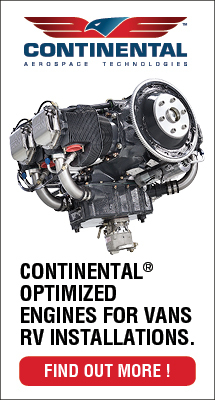 ft; cabin width--44 in; empty weight--750 lbs; fuel capacity--26.4 gal; 75% power cruise--110 kts; climb rate--1,050 fpm. You probably know the Sky Arrow. This smooth tandem Light-Sport Aircraft from Italy uses exquisite construction and I found it to fly beautifully (read my report). Sky Arrow is imported by Jon Hansen and his family. 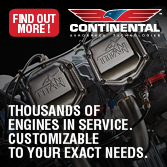 Jon represented Tecnam aircraft (also of Italy) for several years, helping to launch that brand. Hansen Air Group and Tecnam ended their relationship a couple years back, and since then Jon and his team have been seeking another aircraft to represent. That search is over. *** At Sun ‘n Fun 2008, Hansen Air Group showed their new entry, the FA-04 Peregrine, built by Flaeming Air of Germany. The low wing beauty is mostly carbon fiber and was refashioned to be a Special LSA, following Flaeming’s success at winning VLA approval in Europe. Interesting Note: Hansen’s Sky Arrow also started with VLA approval, which helped it qualify as an SLSA.